While everyone came to know and love Mike Myers for his portrayal as Shrek, he wasn't the first choice for the role. As history has told us, Chris Farley was originally slated to voice the anti-social fairy tale hero that helped build Dreamworks Animation, and yet there's never been any audio of Farley's almost complete performance released to the public. Of course, that's all about to change as after all of these years, someone's found a sample of what Chris Farley's Shrek was supposed to sound like. Consequence Of Sound found the above clip from the original 1997 story reel in a Reddit post. As the story goes, Farley had recorded 80 % – 90 % of Shrek before his untimely death in December of that same year, and that work was shelved. As you can hear in Farley's performance, Shrek originally sounded more or less like Chris Farley's natural speaking voice. While the basic story of Shrek owning his own piece of the swamp still remains, the Farley version of this scene seems built on a little more improv. However, after Farley's passing, the forces behind Shrek were in trouble. Enter Mike Myers, who took the role of the titular ogre as a sign of respect and as a tribute for the passing of a dear friend. With a newly added Scottish accent, and some additional re-writes, we got the smash hit that we all remember seeing in theaters in 2001. Which turned the 1997 story reel's version of the fire pit scene into the one we remember below from the theatrical release of Shrek. The '01 redesign is definitely a cleaner and more merchandising friendly product than the original '97 design. While the story is supposed to be about an ugly ogre, Shrek did need an ogre cuddly enough to drive parents to the theaters and the toy stores. 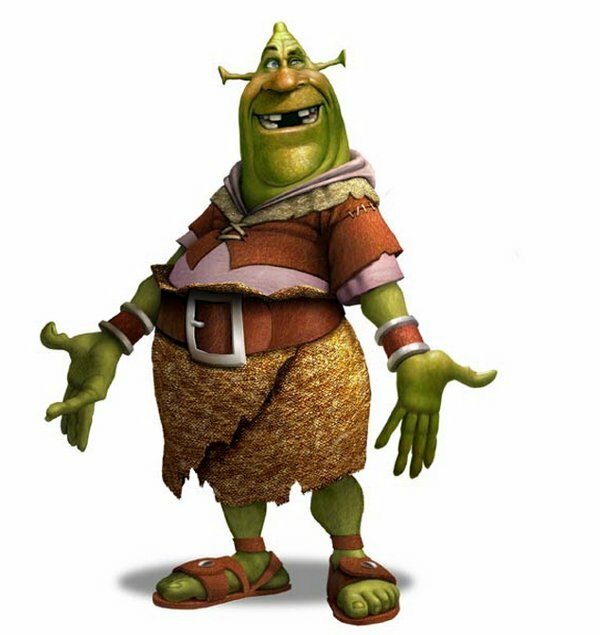 In the original concept, it should be noted that you can see a little bit of Chris Farley in the inspiration for Shrek's original look. The costuming is pretty much the same, but that goofy grin and those eyes are very similar to Farley's own visage. With this new footage released, and the fact that so much of Chris Farley's performance was completed, perhaps the time has come for Dreamworks to do something unprecedented. Since it's only a matter of time before a Shrek reboot / sequel is brought up for discussion again, why not present the public with a "re-imagined" version of the original film? Only this time, the dialogue that Farley originally recorded would be included, in its entirety. Even if this new cut of the film was included as a bonus feature on an inevitable anniversary edition re-issue on Blu Ray, it would be a singularly interesting experience to see just how different Chris Farley's' version of the fractured fairy tale would have played out. For now though, you can watch the Shrek franchise on DVD, Blu Ray, and Digital HD.